EK Water Blocks, Ljubljana based premium liquid cooling gear manufacturer, is proud to announce the close cooperation with GALAXY, top tier NVIDIA® authorized partner. The first fruit of collaboration is the GALAXY GeForce GTX 780 Ti V20 Hall Of Fame (HOF), the company’s first liquid cooled graphics card on the market. “The GALAXY GeForce GTX 780 Ti HOF V20 is a monster in terms of performance and overclock ability. 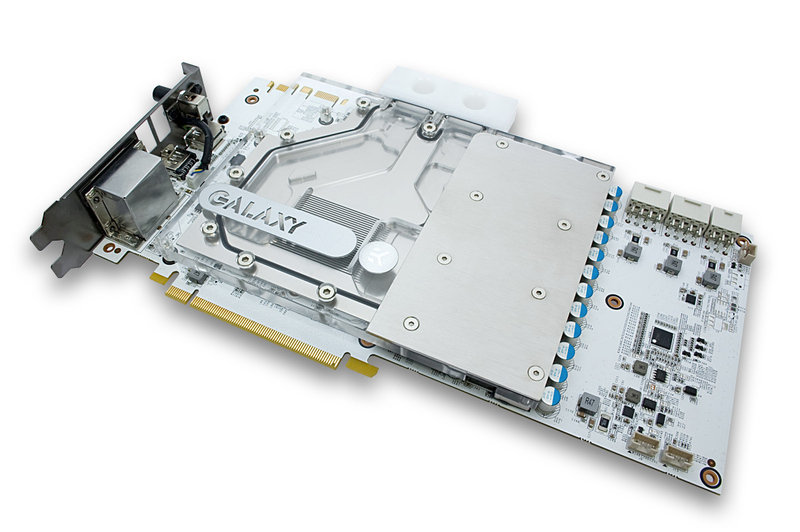 We wanted a water cooling solution that allows the card to perform at its best even without extreme cooling such as LN2” said Edward Chow, GALAXY Product and Marketing Manager. “EK, with it’s expertise on water cooling design, provides exactly what we want”. This limited edition GALAXY GeForce GTX 780 Ti HOF V20 offers a NVIDIA® GK110-425-B1 core, 3 GB of GDDR5 memory over a 384-bit interface and is factory overclocked to 1085/1150 MHz from the reference clock speed of 876 MHz/928 MHz (base/boost) – an astonishing 24% overclock! Similarly, the graphics card also includes high-end tantalum capacitors, an 16+3 Phase VRM and an EK Water Blocks designed and built EK-FC780 GTX Ti HOF V20 water block to ensure dead silent operation and unmatched overclocking potential. Founded in 1994, GALAXY has built its reputation as the behind-the-scenes designer and manufacturer of many of the most popular OEM-branded graphic card products on the market. Since 2000 we have introduced numerous critically-acclaimed products under our own brand, and our portfolio has been expanded to include graphics cards, SSDs, power supplies and tablets powered by the Android operating system. We are dedicated to creating a customized user experience and believe that each of our products needs to fit its owner, not the other way around. What we make is not merely the product of focus group tests, but rather the results of observing and honoring the way individuals choose to interact with technology. Our customers guide everything we do at GALAXY, and it’s this commitment that defines the company.